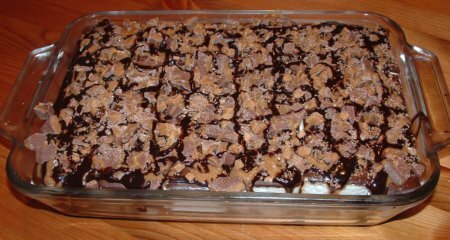 You take any casserole type dish and place a layer of ice-cream bars on the bottom. I used an ice-cream bar with chocolate on the outside and vanilla on the inside. I then squeezed some chocolate sauce and caramel sauce all over the ice-cream bars. Then cover them with broken up score bar. I placed the score bar in the wrapper on a cutting board and hit it with a hammer to break it up. Next, place another layer of ice-cream bars. Then repeat squeezing the chocolate and caramel sauces. Then I spread 3 score bars. To finish off the cake I spread the sauces one more time to make a pretty design. I covered the casserole dish and placed back into the freezer until it was ready to serve. It was the hit of the party. 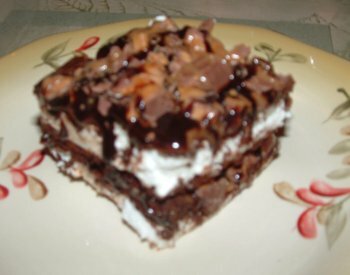 Everyone loved this Chocolate Caramel Ice Cream Sandwich Cake!